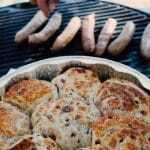 These Camp Site Cinnamon Rolls are quick and easy for camping breakfasts and work well for large groups or family. Kids love them too! This post may include affiliate links. Please see our disclosure page for more info. Cinnamon rolls are probably one of my favorite breakfast treats, so for me it’s pretty exciting to be able to make them when I’m out on a camping trip with my friends. What makes it even more appealing is how easy they are to make. This is basically a set-it and forget it recipe that you can leave cooking while you’re getting ready to tackle your day, or packing up your vehicle for the ride home. 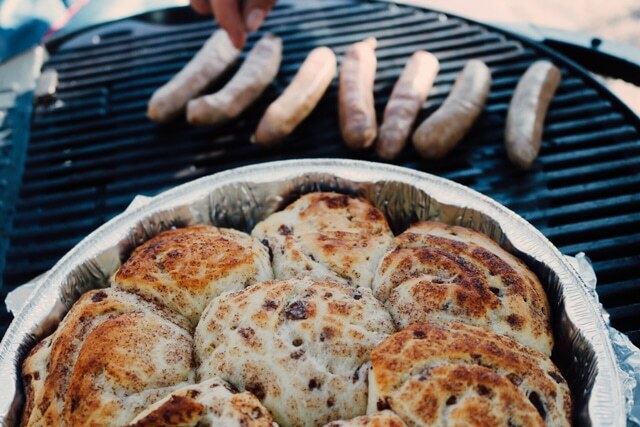 Pro tip – I love pairing these sweet cinnamon rolls with a savory breakfast sausage. You can throw them on the grill at the same time and add some protein to your camp breakfast meal. Place baking tin on the grill, covered over low heat. Open the tube of cinnamon rolls and set icing aside. Layer cinnamon rolls on your round baking tin or cast iron skillet. Place baking tin on grill, covered over low heat. Cook for 20-25 minutes until cooked through. Serve with icing.